The flag of Çaycuma (photo) is white with the municipality's emblem. "Belediyesi" means "Municipality". The flag of Filyos is white with the municipality's emblem, either inscribed within a green ring (photo) or not (photo). "T.C." stands for "Türkiye Cumhuriyeti", "Republic of Turkey"; "Belediyesi" means "Municipality". 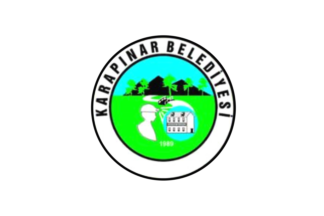 The flag of Karapınar (photo) is white with the municipality's emblem. "Belediyesi" means "Municipality". The flag of Nebioğlu is white with the municipality's emblem. "Belediyesi" means "Municipality". The flag of Perşembe (photo) is white with the municipality's emblem. "Belediyesi" means "Municipality". The municipality of Saltukova (3,886 inhabitants in 2010) is located 15 km north of Çaycuma and 45 km east of Zonguldak. The flag of Saltukova (photo, photo) is white, or celestial blue, with the municipality's emblem. "Belediyesi" means "Municipality". The emblem of the municipality features a train and a railway, recalling that the town boomed after the establishment in 1937 of a train station on the Ankara-Irmak-Zonguldak line.